Solid construction and effective in design, the Force USA Hammertone Olympic Weight Plates are made for everyday gym use, and designed for a snug fit in the hand. Featuring heavy duty structural integrity, the Force USA Hammertone Olympic Weight Plates are built to take a pounding and help you expand your range of exercises. And, with an “Class A” rating, the Force USA Hammertone Olympic Weight Plates are built to last a lifetime. The Force USA Hammertone Olympic Weight Plates are unmatched in their class and will give you solid and intense workouts for many years to come! The Force USA Hammertone Olympic Weight Plates are made by a one-piece forged construction, giving you the ultimate workout and safety knowing that your Force USA Hammertone Olympic Weight Plates are the best quality. 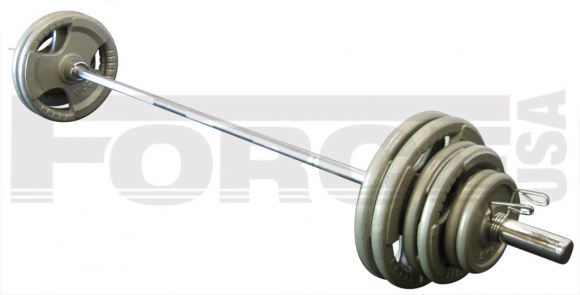 The Force USA Hammertone handles are ergonomically designed to handle extreme workouts in the gym, so you can rest assured you are buying quality when you go with Force USA. With the Force USA Hammertone Olympic Weight Plates you will have intense workouts for a variety of different muscle groups while maximizing the effectiveness of your workouts with a combination of core and strength workouts. The Force USA Hammertone Olympic Weight Plates provides some of the best, most effective strength training exercises. Use at the gym or at home to mix up your exercises and take your training to the next level! Product Specifications Ergonomically designed in the USA Tri-Grip Handles on all heavier plates Full commercial gym use. For use with all Olympic bars and plate loaded gyms and single station machines. 51mm diameter hole so that they will fit all Olympic bars. Handles on heavier plates for easier and safer handling. Embossed with KG’s. EcoCoat™ will not rub off on your hands while in use.